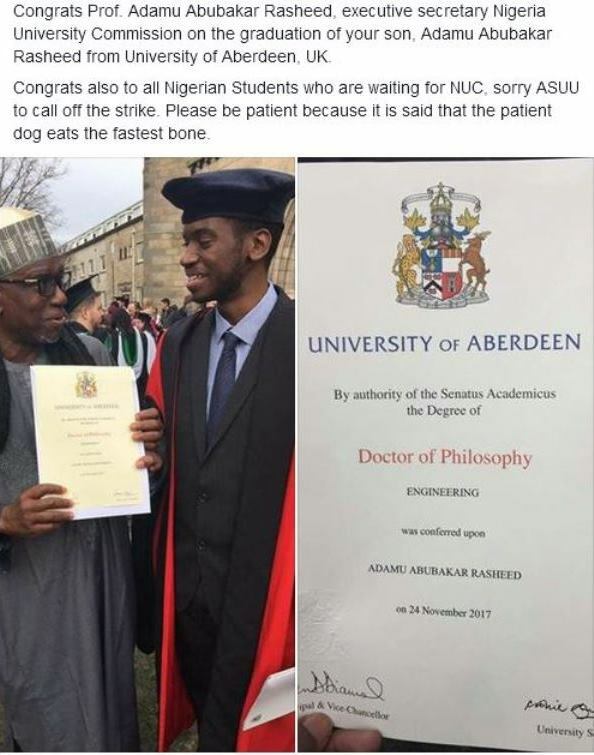 The Academic Staff Union of Universities (ASUU) is a body known for its frequent outbreak in strikes majorly due to the Federal Government inability to meet up its monetary demands with the latest strike action which kicked off on 5th November, 2018 a major source of concern to Nigerian students within the federation as different approaches to resolving the ongoing strike is still being explored. However, the lackadaisical attitude of the Federal Government towards the ongoing ASUU strike is no longer an issue to be dealt with lightly as students lament daily over their long stay at home thus many have resorted to fabricating fake news and allegations especially against the executives of the academic union. SecretReporters gathered that recently, a fake news circulating the social media in Nigeria has it that the National University Commission (NUC) Boss, jetted off to the United Kingdom to celebrate his son’s graduation while the deliberations on the ongoing ASUU strike was left pending, and as such leaving the curiosity of Great Nigerian students aroused regarding the current strike action. 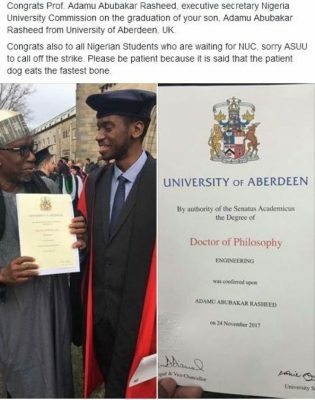 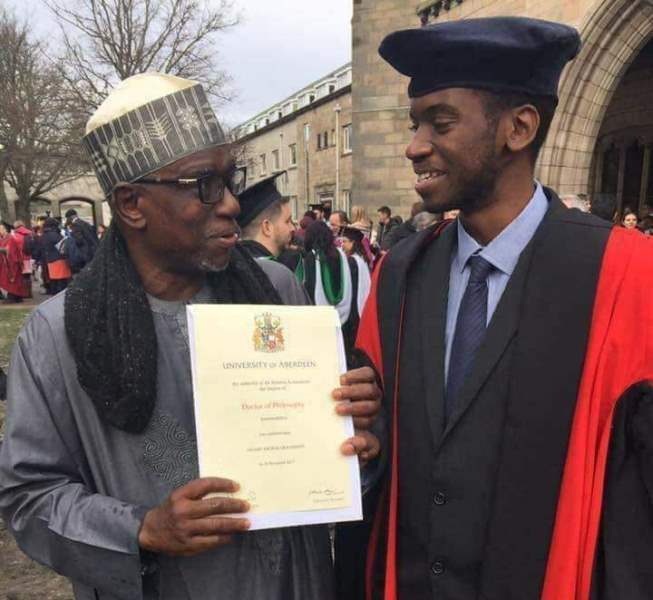 The fake post which comes with different captions like “While ASUU remains on Strike, head of Nigerian Universities Commission (NUC) jets to London to celebrate with son” had a picture with a brief congratulatory message from Prof Adamu for his son who bagged his doctorate from the University of Aberdeen in the United Kingdom a year ago. 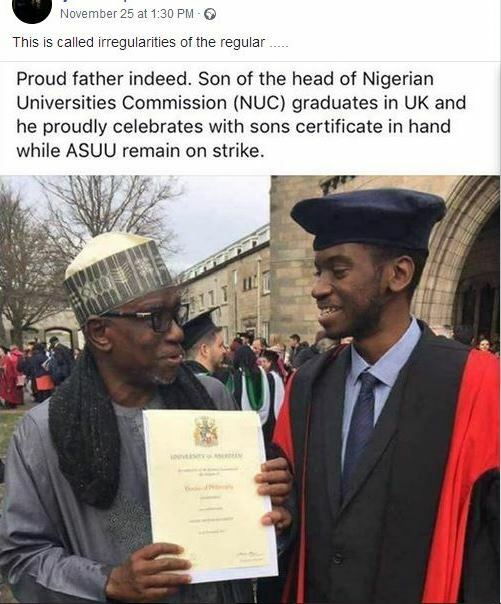 The original post we learnt was initially circulated online late last year and have recently found its way back into Nigeria’s social media space with ASUU still on strike as it is purportedly used by some elements whose intentions are solely to heat up the polity and perhaps coarse Nigerian students who are most affected by the strike action to engage in social media gangsterism where the openly use profane languages and hate speech especially with the 2019 general election around the corner. 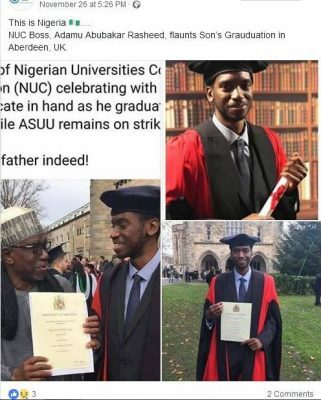 The ongoing strike action which is now in its fourth week with several meetings between the Federal Government and ASUU ending up in a deadlock may have left the productive interaction of many Nigerian Students with their studies jeopardized as parents, students, and Nigerians while condemning the spread of fake news and the use of hate speech online call for a quick intervention by the Federal Government if there is any hope of salvaging the crippling educational system in the country.